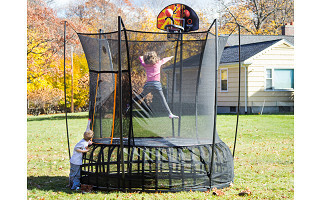 A trampoline is all “Whee!” for kids, but can create anxiety for parents. That’s why the team at Vuly made a safer trampoline with better bouncing to keep everyone happy. Unlike traditional trampolines, Vuly designed the Leaf Spring system. It’s a ring of rounded, steel beams that supports the platform and gives jumpers a bigger—and safer—boost. There are no coils to get caught in, or nuts and bolts that might loosen over time. The frame clips together and is powder-coated, too, for added durability (it can support over 1,000 pounds!) and to resist rust. Soft-but-strong netting corrals bouncers back to the center of the mat, and a layered entry hatch helps keep kids contained. Founder Joe Andon and his team wanted to improve trampolines, but after years of tinkering with minor improvements, he decided a total redesign was the way to go. 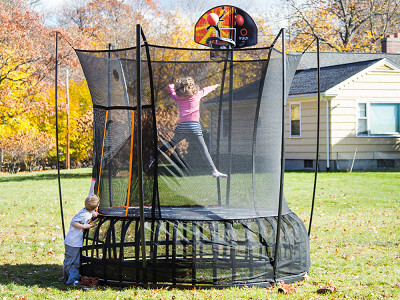 Their innovative take on a backyard staple is a win for bouncing kids and their parents. A trampoline is all “Whee!” for kids, but can create anxiety for parents. That’s why the team at Vuly made a safer trampoline with better bouncing to keep everyone happy. Unlike traditional trampolines, Vuly designed the Leaf Spring system. It’s a ring of rounded, steel beams that supports the platform and gives jumpers a bigger—and safer—boost. There are no coils to get caught in, or nuts and bolts that might loosen over time. The frame clips together and is powder-coated, too, for added durability (it can support over 1,000 pounds!) and to resist rust. Soft-but-strong netting corrals bouncers back to the center of the mat, and a layered entry hatch helps keep kids contained.